Our experience developing over years through numerous projects on four continents has let us spot the needs of the event professionals. To answer your expectations we have developed our 3D Configurator that allows you to create and modify your reception space online and to present ideas to your clients. Keep the structure inflated by a slight overpressure. Permanently renew the air inside within a range of 2 to 7 times the volume per hour, depending on the climate conditions. The noiseless ventilation system can be placed at a distance or integrated. It also purifies the air supplied. Mosquitoes, dust, pollen, allergens and cars emissions are blocked by the particulate filters. Heating and air conditioning can be integrated to the system to regulate the temperature inside the structure. The air blowers consume little power (55 to 97W). For a number of models, the turbines achieve considerable energy economy. 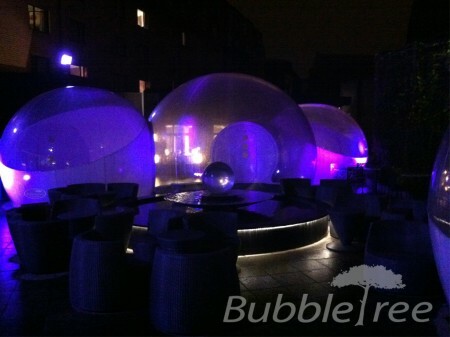 Easily heated and air-conditioned, the Bubbles can be installed indoors and outdoors at any season. The high resistance to the wind allows installation on many windy sites without using excessive ballast. 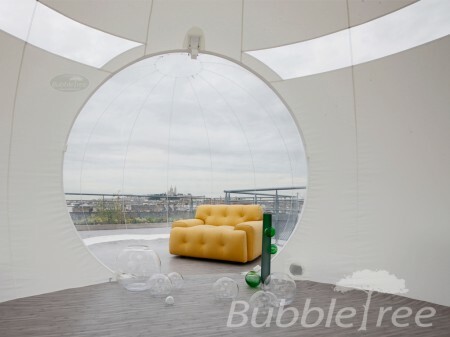 Thus, the roofs and terraces are easily transformed to BubbleTree Event venues. Our Bubbles are conceived and made in France using the technology that ensures the top quality, reliability and artistry of the form. The materials used pass regular controls and are certified as low-flammable. They are treated against UV and are 100% recyclable. The BubbleTree Event range complies with the norms of accommodation of people as well as SG and CTS. We have the RC EVENT and are members of the ASPEC.